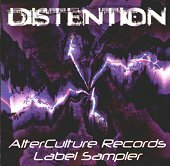 Distention is a display of talent for an up and coming records label called AlterCulture Records. Mindless Faith, Ruadive, Gears Slowly Grinding, The Unquiet Void and Vivid Liquid come together on this one CD for five different sounds with some similarities. Mindless Faith has the first four tracks. The tracks are coated with heavy laden beats, absorbing melodic keyboards and harsh (but not overly layered distorted) vocals. All tracks have tight woven sound and are danceable. On the contrary, there is Raudive Voices which has the corner of organized chaotic experimental industrial. "Flicker," and "Accused" are slightly more involving, disoriented and less club friendly then their last track "Dessau." Very Creative. It is impossible to know all the things going on in their songs through just one listening. Gears Slowly Grinding is defiantly an aura, atmospheric side project. The songs "Induce" and "Delusion" are soundscapes with a pace. Melodies are filled with lots of juicy ebb and flow. Reviewer's note - "Induce" is one of those songs that you close your eyes to, turn out the lights and let your imagination go. Personally, my imagination went to 2 weird alien creatures making alien-love in a wild scenescape, umm... but I am sure it's different for everybody. Next is The Unquiet Void, who have also been represented on another well-known compilation called The Unquiet Grave. The tracks done by this group are more intricate and developed than their companion Gears Slowly Grinding. They have the same modus operandi but two different ways of going about it and they develope completely different sounds. The Unquiet Void keeps the music without any notable beats and vocal-less. Finally, Vivid Liquid comes in with lyricless, heavy sythnthesized chime and eerie ambiance. In all, I believe once the word gets out on the label, people will be hearing alot from these guys. They have the talent and the innovation to succeed.